This photo warms my heart. Buck is at home. You captured a very lovely moment Justina! Looks like Buck has found the love! Awwwwwwwwwwwwwwww. SO glad Buck has found a safe and loving place to hang his hat!!!!! I’m melting over here! So sweet. Just great to see. He is absolutely in Buck heaven! Looks like his new mates are pretty happy with the arrangement, too! 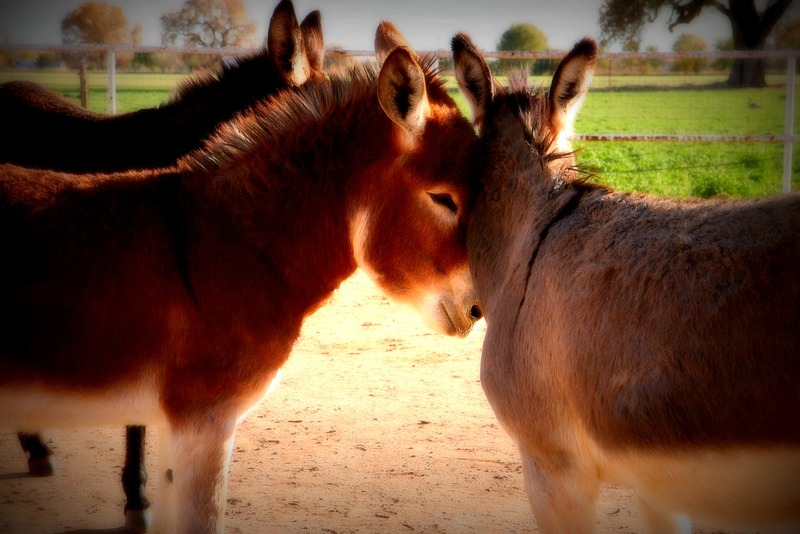 Love this picture with the soft Halo around the donkeys’ faces and I can see that Buck is smiling being so contented with his new home and donkey friends! That’s my new background………..so I can smile everytime I turn on the computer ! I actually said, awwwwww, when I looked at this wonderful picture. That’s peace, love and contentment. Beautiful. What a sweetheart. That picture gives me a warm happy feeling. And so happy for Buck. Seeing this has definitely set my morning on the right track! How *awesome* that they get along!